Australian humpback dolphins were just identified as a distinct species last month, but scientists are already discovering just how impressive they really are. 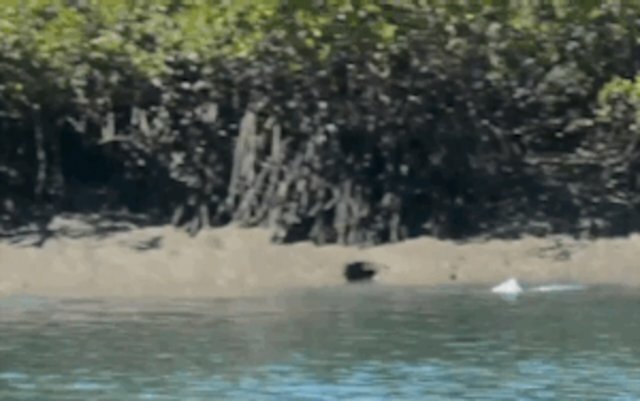 For the first time, footage has been captured of the dolphins employing a remarkable hunting technique - venturing onto land where their prey can be easily gobbled up. 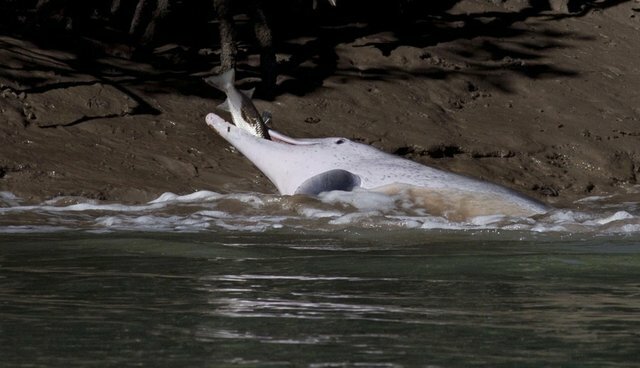 A team from Southern Cross University had been following a pod of humpback dolphins up the Fitzroy River estuary, near Queensland, when they heard some strange splashing sounds off in the distance. When they looked closer, they discovered the animals were actually thrusting themselves onto the shoreline in a behavior known as "strand-feeding". (Southern Cross University) Watch the full video here. Researcher Daniele Cagnazzi described it to Business Insider Australia as "an incredible event." Fortunately, a camera was able to collect video of the rare sighting, which had only been observed in these dolphins once before. "The humpback dolphins were observed swimming a few metres away from and parallel to the shoreline. This behaviour probably allows dolphins to concentrate fish against the mud bank before charging at them at high speed," said Cagnazzi. "On some occasions the fish were washed onto the shoreline by the wave of water associated with the dolphin's beaching, resulting in a full body exposed beaching." Australian humpback dolphins aren't the only ones to use this remarkable foraging method. Both bottlenose dolphins and killer whales have also been known to strand-feed, often working in unison with their pods to push a school of fish ashore. And Australian humpback dolphins in particular would be well-advised to avoid becoming permanently stranded. Although they are the latest species of dolphin to be identified by science, biologists say that they may already be endangered due to various threats in their environment.